Nitric oxide is known as a vasodilator. In other words, it supplies more blood and nutrients to the muscles during any workout. This is one of the reasons why nitric oxide supplementation is very popular in these modern times. However, not all products are alike and you could very literally be throwing our money away in some cases. 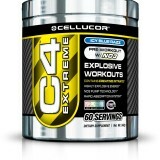 Recently, our experts purchased and tested a 45-serving container of a brand known as Cellucor C4 nitric oxide powder. Let’s have a look at this product in more detail. First of all, Cellucor C4 contains no less than 37,500 per cent of vitamin B6 for an explosive pre-workout kick. This is then added to appreciable amounts of vitamin C (375 milligrammes), creatine nitrate (1.5 grams) and arginine AKG (1.5 grams). Unlike some other products, our tasters noticed that there were less “fillers” such as sugars and starches in C4. Perhaps most importantly, no caffeine was present. This is critical, for many will state that they become jittery soon after taking nitric oxide supplements. However, some individuals in our panel did get a slight “tingly” feeling and this can be attributed to the levels of beta alanine (such a sensation is completely harmless). The taste (blue raspberry) was outstanding and it blended extremely well with water. Those who are concerned with sugar will be pleased to note that there is none within C4. The only drawback is the price. It costs more than 60 dollars (approximately £40) even when purchased through an online retailer. Those who are on a tight budget may be taken aback by this feature. However, this product is still quite new and it is likely that the price will drop in the future.